It’s not surprising that as progressive rock and heavy metal both took off in the 1970s that they would eventually cross over. Bands like Jethro Tull, Kansas, and Rush successfully mixed the muscular guitar thump with the lighter keyboard textures of art rock. A powerhouse player, Alex Lifeson remains among the most innovative rock guitarists of the last three decades. His work with the Canadian power trio Rush is marked by blazing melodic solos, shimmering rhythm parts, and a frequent use of “modulation” effects, such as chorus and echo. Some of his best electric solos are in tracks such as “La Villa Strangiato,” a complex instrumental, and “Limelight,” which includes tasteful tremolo bar effects and a strong sense of melody. In addition to his fiery lead work, Lifeson is also a skilled rhythm guitarist and, like the Police’s Andy Summers, makes extensive use of chorus effects in his arpeggiated chord progressions. He is equally at home with electric, acoustic, or classical guitars. A veritable jack of all guitar trades, Lifeson often pushes the envelope of rock guitar — if not licks and stamps it, too! Figure 1 concentrates on Lifeson’s unique chord parts. Instead of block barre chords, Lifeson often lets the upper E and B strings ring open, making his 6-string guitars sound like 12-strings. Add a chorus pedal to heighten the effect. Figure 1: Airy electric chords that use ringing open strings and a full strumming technique. Music: Rush featured distinctive rhythm guitar parts as well as progressive leads. Technique: Strum your electric like an acoustic to make the open strings really ring out. Martin Barre joined Jethro Tull in 1969 and has been their electric guitarist ever since. His tough guitar work is all over early 1970s hits such as “Cross-Eyed Mary,” “Locomotive Breath,” and the FM-radio anthem “Aqualung.” His solo on “Aqualung” is particularly noteworthy because it possesses a melodic sense rarely shared by his hard-rock brethren. But Barre is also known for his killer riffs, usually played on a Gibson or Hamer solidbody going through a tube amp stack. 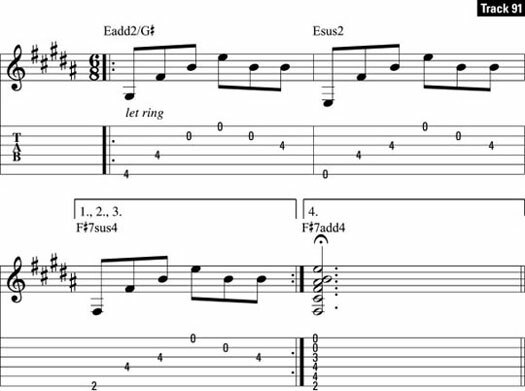 Figure 2 is a riff in the classic Martin Barre style: simple, distorted, and full of visceral punch. Make sure to mute the strings completely for the “scratch” effects. Figure 2:A heavy rock riff with an unusual non-diatonic note at the end. Music: A Tull-like progression in the style of a classic piece of early-1970s hard rock riffery. Technique: Play simple power chords decisively and with aggressive downstrokes.